As he sat in his leather office chair Tuesday morning, Ducks manager Kevin Baez looked as comfortable as could be. A smile plastered across his face, he looked up and down the Ducks’ projected lineup on the whiteboard that hangs beside his desk. He liked what he saw, and for good reason. Not often does a manager have the luxury of writing the names of the last two batting champions on his lineup card every day. But days before the Atlantic League season opens, that’s the situation in which Baez finds himself. When the Ducks take the field for the first time Thursday night in Somerset, New Jersey, kicking off 2016 against the team that ended their 2015 season, former major-leaguers Lew Ford and Sean Burroughs will be nestled in the middle of a potentially potent lineup. 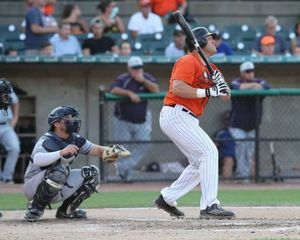 Burroughs, 35, last year’s Atlantic League batting champion at .340, has spent time with the Padres, Rays, Diamondbacks and Twins and came to the Ducks in a trade last August that sent Port Jefferson native Bryan Sabatella to the Bridgeport Bluefish. In 37 regular-season games for the Ducks, Burroughs hit .366 with one home run and 24 RBIs. In the Ducks’ five-game Liberty Division Championship Series loss to the Somerset Patriots, he hit .444 with four RBIs. Ford, 39, who is entering his seventh season with the Ducks and won the 2014 league batting title, hit .364 with eight home runs and 63 RBIs in 75 games last season. Ford, a former Twin and Oriole, missed 59 games last season to play in the Mexican League and did not have enough at-bats to qualify for the batting title. Ford said he will “probably not’ return to Mexico and doesn’t plan to leave the Ducks for anything other than an offer from a major-league team. Should they both stay at Bethpage Ballpark for the whole season, Burroughs and Ford see major advantages to having the other in the lineup. Ford and Burroughs are two of 16 returning players from last year’s 80-win team. Somerset, the team that kept the Ducks from returning to the Atlantic League Championship Series for the fifth time in their 16-year history, was the only team that won more games (89). And his players believe in it. Another Atlantic League championship, the Ducks’ first since 2013? Now that would really bring a smile to Baez’s face.